A Bumper is an item in Super Smash Bros., Super Smash Bros. Brawl, Super Smash Bros. for Nintendo 3DS / Wii U, and Super Smash Bros. 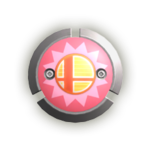 Ultimate; in Super Smash Bros. Melee, the Bumper is replaced by the Flipper. In Super Smash Bros, it falls to the ground when thrown, causing only one percent of damage to players who bump into it and causing weak knockback. As of Brawl, Bumpers can also float in midair when thrown (making it possible to use them as deterrents for opponents trying to recover) and only damage players hit by the initial throwing. They no longer move if bumped into, although the knockback is far greater, and it increases as the target's damage increases. In Super Smash Bros. for Nintendo 3DS / Wii U, Bumpers have a new design: the outer part is silver instead of blue, and the central part is red with a yellow Super Smash Bros. symbol. This design is also used in Super Smash Bros. Ultimate. In Super Smash Bros., there is also a Bumper floating above the Peach's Castle stage; this Bumper retains its original appearance and damage properties in the stage's return in Super Smash Bros. for Nintendo 3DS / Wii U (DLC) and Super Smash Bros. Ultimate. Bumper An item that originally appeared in Super Smash Bros. on the Nintendo 64. After many years, it now makes its triumphant return. Bumpers are used in pinball to send balls flying, and they perform the same role in Smash Bros. They react to anything that touches them, including the people who set them. As they can also be set in midair, using them requires good tactics. Wii U Super Smash Bros. for Wii U Ah, pinball... What a fun game. And with this item, you can add a bit of pinball to the battlefield. Once thrown, this item will bounce anything that comes near it violently away. Just don't get careless and walk into a deployed one yourself, or you'll get bounced too! Original appearance from Super Smash Bros. This page was last edited on March 19, 2019, at 07:31.